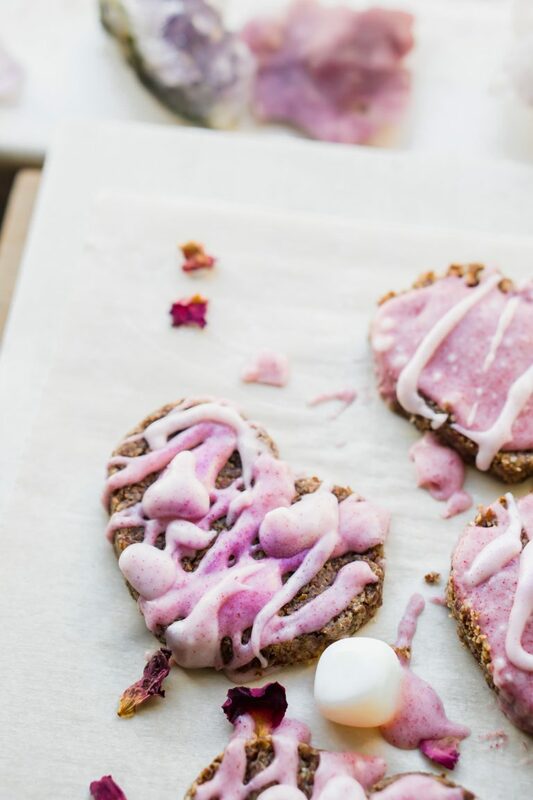 Coconut cranberry glazed almond butter cookies (vegan, gluten-free, paleo, & sugar-free) if you haven’t noticed Valentine’s Day is my absolute favorite day to celebrate. I just love LOVE. Not just romantic love… all love. I love people watching and seeing someone do an act of kindness. I love seeing couples of all kinds holding hands and walking down the street. I love seeing hearts filled everywhere and people showing love. 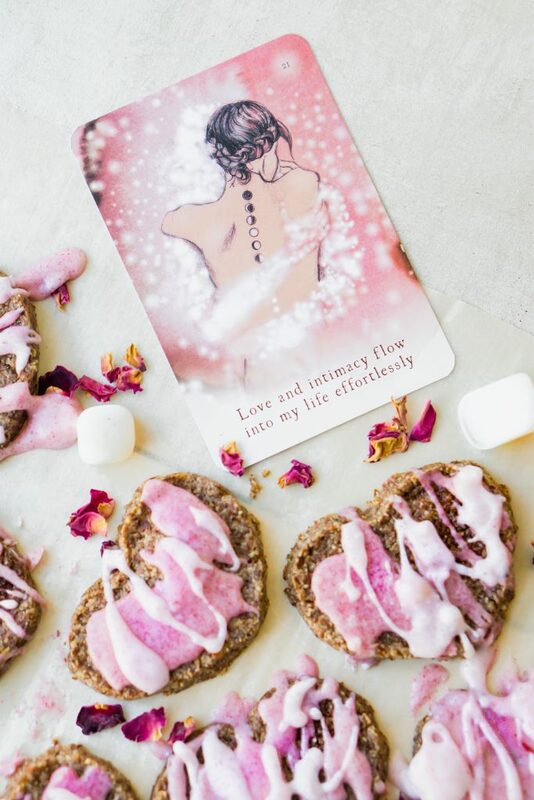 I don’t believe love just has to be shown on Valentine’s Day but do appreciate the moment to stop the world and just to give and receive love to yourself or your partner. It could even be your best friend or your puppy. I assume you get the point I am trying to get it. With that being said let’s dive into the cookie details. 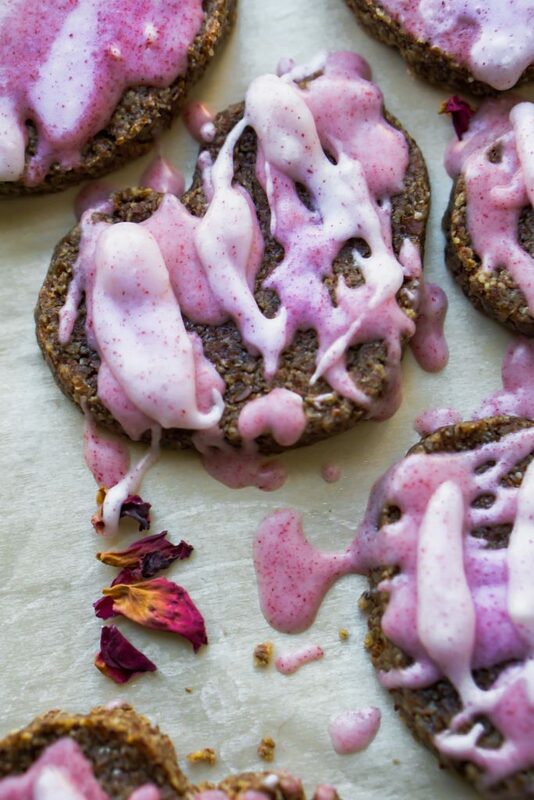 These almond butter cookies are what I have been searching for nice and fluffy on the inside and filled with really good for you ingredients. I’m still on my sugar-free journey and feeling amazing these days but I still love baking for my partner and friends. Is anyone else’s love language baking or cooking food for other? Mix that with cuddling up with a book & my love. Those all combined you have yourself a happy human here. I’m sure you have been just as busy in the daily hustle and if that is the case I truly wish you an hour or so just to unwind, relax and show yourself and your loves some love. Don’t we all deserve that? A moment to just sit in stillness. I’ve been getting that message a lot and it is has helped me. I am not one who can just still down on the weekend and relax but I have been adding in moments of stillness as much as possible. I wish the same for you and your loved ones. The hero ingredients are almond butter, almond flour, flax seed & coconut oil. 3. They protect artery walls from damage. If you don’t have raw monk fruit start to add in any sweetener of choice if you are using stevia start with a teaspoon at a time, if using honey start with a tablespoon at a time… etc. I used a very concentrated amount of raw monk fruit extract, therefore, depending on what you have that could change. For my cookie shape, I used a cookie cutter similar to this one. If you want to change the berry feel free to use strawberry or raspberry either would be delicious. If you are on Body Ecology the base of the cookie is completely BED friendly. I would leave the glaze/frosting for stage 2.
add 2 tablespoons of ground flax seed with 6 tablespoons of water, let sit for 5-10 minutes you will know it is done when most of the water has been absorbed. In a large bowl add in all of your ingredients BUT add the almond flour in last and mix slowly.You can use a fork to mix competely or I used a mixer which was really helpful.Add in your flax eggs when they are ready. Than add in the last two tablespoons of flax at the very end. spoon into your heart shape. scoop out a tablespoon of the cookie batter out into a heart shape or any shape you prefer. 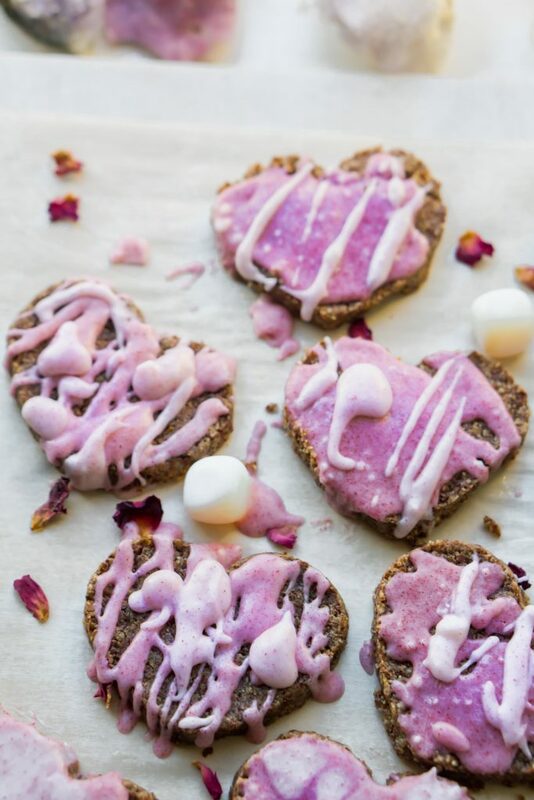 the batter will look very oily – once you have pressed all the cookies into hearts use a paper towel on top of the cookie to absorb the extra oil. Only press lightly so you don’t kill the cookie. Bake your cookies for 8 minutes at 350 degrees. Please let me cool for about least 5 minutes otherwise they will fall apart. Make your frosting while they are baking. in a food processor blend your coconut oil, butter and sweetner until very smooth and gooey. When cookies are done & cooled. Cookies are ready to be frosted when they have been completely cooled off. I drizzled the frosting over the top – have fun with it & enjoy!